The Eight Box method is Dr. Rajan Sankaran's most recent evolution in homeopathic practice. It involves classifying the patient's information into 8 different aspects. It compels the physician to look at the different aspects and find the thread that connects all the different aspects. It allows use of several methodologies synergistically in different cases. It is a reproducible tool that helps to gain consistent results. Illustrated with several cases, this book aims to reduce the chances of error that can arise as a result of prejudice or from looking at only a part of information. A few years ago, during a seminar in Mumbai at The Other Song academy we witnessed a live case by Dr. Sankaran. At that time, he had not yet developed his analysis system with the Eight Boxes. During this case, amongst the other symptoms, the patient described a feeling of lightness, the delusion of flying and a feeling of being under pressure. We were swept away by that delusion and completely forgot what the patient said at the beginning of the consultation, the main issue being fear and terror. We did not even consider the general or local symptoms. Our mind automatically jumped to the most well-known place, the sensation. We thought that the patient needed a plant remedy from the Hamamelidae family and we totally missed the remedy. At that time, we did not have the eight-box tool to help us recognize the unconscious pattern, the other song, the noumenon that was unfolding before us in every aspect of the patient. The idea of its existence was present, but we lacked the appropriate instrument to keep our attention active in all areas of the patientâ€™s story, as to recognize the level where the pattern is most clearly manifested and to find it on every level. With the resource of the Eight Boxes, the case unfolds as with a prism that breaks a light beam and then we can assemble its parts again. In each color the whole is implied. Eventually that prism would be internalized, and we could look at everything in a fragmented way and then watch it come together again. 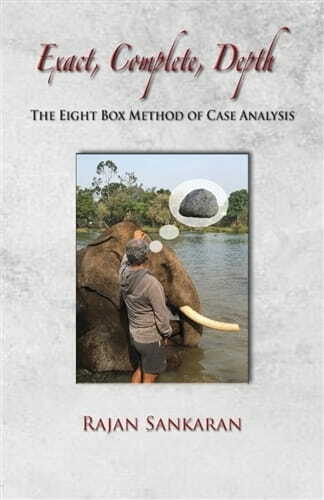 The Eight Box method is a priceless tool for analyzing and summarizing a case for prescription, teaching and follow-ups. It is a helpful resource that is dynamic and flexible in the sense that it is the patient who determines the structure of each box. In this way, the prescription easily achieves the three parameters that Dr. Sankaran emphasizes: exactness, completeness and depth.